Though you may have a few reservations about your roof overhauled in the frost, try considering the positive side of renovating in the cold seasons. Even the South gets chilly winds and ice. Your home’s first line of defense is your roof, but a roof with holes won’t do your home or your family any favors once the frost sets in. Thankfully, frosty conditions do not particularly affect experienced roofers. If you are having trouble with your roof, get it fixed, so everyone can stay warm! Fix Things Now. Don’t Wait! 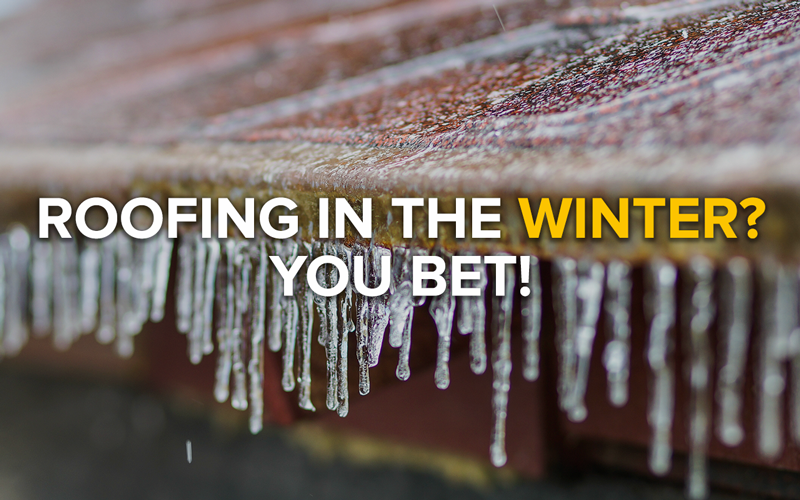 If you think your roof’s leak won’t get any worse until the temperature begins to warm up, you may be in for an unwelcome holiday surprise. You guessed it–waiting to patch up your roof will only make things worse the longer the problem persists. If your roof is leaking, putting off this project can give time for built-up water to cause more difficulties, and mold will eventually start growing. On top of that, the change in temperatures from cold to warm and back forces your roof to expand and contract, which can lead to even more damage. Although we don’t get much snow, it can still happen from time to time. However, removing slush or ice is not a problem. Doing so creates a safer environment to work in, and after it is pushed off the roof, installation can begin. Freezing or Not, We Can Do It! Multiple types of roofing materials, like asphalt and metal, are not susceptible to winter’s chill, so installation is not any more difficult than it is in other weather conditions. However, asphalt installation does require extra attention to avoid breaking, bending and staying in place. With this said, roofs that require adhesives will not work to their full potential in this climate. Summers get hot down here, and roofing contractors have to endure the elements. So, when winter comes around, some contractors prefer to work in the cooler temperatures, because it’s much more comfortable. Asphalt and metal roofs can become very hot, which sometimes raises safety concerns for the workers. This is not always the case in the winter months. Do you have a leaky roof? Contact us this Fall, so we can get to work on repairs or a brand-new project. Come see what V & V Roofing has to offer before your house gets too cold!